There were a lot of close-but-not-quite moments for USA Shooting rifle and pistol athletes last week as several of them came up just short of spots in the finals at the Bavarian Airgun Championships in Munich, Germany. Athletes were chosen based on their performances at the recent Winter Airgun Championships that were contested at the USA Shooting Center in early December. They competed alongside athletes from over 60 nations as the 2014 shooting competition season gets underway. The U.S. highlight of these championships came from Junior National Team member Alana Townsend (Kalispell, Mont., pictured right) who qualified for her first international final in Junior Women’s Air Pistol. Townsend, 19, finished first in qualifying with a 382/400 and would walk away with an eighth-place finish overall Friday. 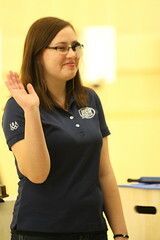 Her 382 is also a personal-best qualifying score, according to National Pistol Coach Sergey Luzov. Townsend also shot a 373 in qualifying Thursday to finish 14th overall. For perspective, a 382 would have qualified her in Thursday's Women's Open Final. Another strong Junior finish came from 15-year-old National Junior Team member Elizabeth Marsh (Searcy, Ark.) who finished ninth in Junior Women’s Air Rifle with a qualifying score of 412.9 on Thursday; just .2 points away from making the final. National Air Rifle Champion Connor Davis (Shelbyville, Ky.) struggled the first day of competition, finishing in 61st place, but was nearly able to make the finals on the last day with a score of 627.2, just .1 points out of qualifying for finals. James Henderson (Midland, Ga./USAMU), a member of the U. S. Army Marksmanship Unit and the USA Shooting National Development Team, was competing in his first international match and finished in ninth place in Men’s Air Pistol. He tied for eighth place with a score of 580, but the tie-breaker to determine who advances to the finals is based on center-ten shots in which Henderson just came up short, 15 to 18. For complete results from the Bavarian Airgun Championships, please visit: http://results.sius.com/Events.aspx?Championship=InternationalerWettkampf20140123MnchenDeutschland. Up next for rifle athletes is the Rocky Mountain Rifle Championships February 10-16 at the Olympic Shooting Center in Colorado Springs. On the pistol side, there will be a selection match February 22 – 28 in Colorado Springs to select the team for the first Rifle/Pistol World Cup event of the year, World Cup USA in Fort Benning, Ga. March 26 – April 4.